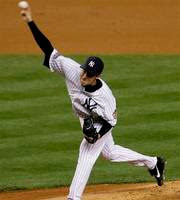 Mike Mussina pitched beautifully last night in the Yankees 6-1 win over the Tampa Bay Rays. He didn't look beautiful, though. In the sixth inning Carlos Pena reached first base safely on a throwing error by Robinson Cano. If Cano had made the play it would have ended the inning. The YES Network cameras were trained on Mussina after the error was made and Moose was obviously highly upset. He was so ticked off that Alex Rodriguez and catcher Jose Molina had to go to the mound to calm him down. After they straightened him out he was able to get BJ Upton to ground into a fielder's choice to end the inning. Mike Mussina is 39 years old. You would think that, by now, he'd be mature enough and enough of a team player to refrain from showing up his teammates. I was really happy for Moose last night but what he did to Robinson Cano really tempered my enthusiasm. The Yankees need Mussina to keep pitching well so I hope he does. But, after last night, he's definitely not going to be on my list of favorite players anymore.